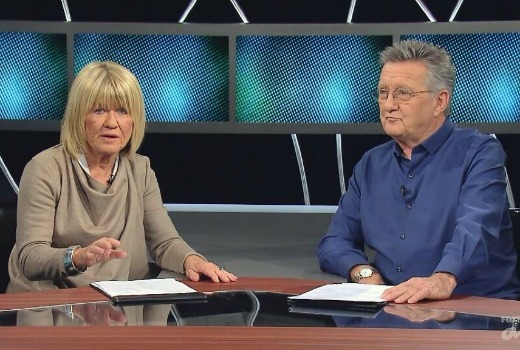 I feel a little silly reviewing a Review show, but pairing Margaret Pomeranz and Graeme Blundell together to discuss all things Screen warrants attention. Nabbing the esteemed Ms. Pomeranz to launch a new Arts channel is an inspired idea. Normally given to discussing the body of work of others, her own needs no introduction. For Foxtel Arts she pairs with The Australian’s television critic Graeme Blundell, also no stranger to Aussie audiences. In this multi-platform era, the show cleverly puts cinema, television and ‘online’ content on the table. Seated behind a large desk -those chairs have now been exiled- they begin with a review of Cinderella. Before you can say pumpkin, Margaret is detailing a film synopsis over showreel footage and launching into a discussion with her newest sidekick. Pomeranz’s descriptive reviews are back, interjected with that distinctive laugh, and passion thrown behind every sentence. It’s as if she never left the screen, and that’s just the way we like it. Blundell is more reserved -but nowhere near as purist as a certain predecessor- with erudite commenary and devotion when it comes to local stories (although it may necessitate a declaration of interest when reviewing Foxtel shows in print from here on). Two television shows are reviewed: Redfern Now: The Telemovie and the season return of Wentworth. The latter becomes their first five star review. It leaves Orange is the New Black for dead says Margaret. Redfern Now gets 4 and 4.5. Screen will also feature a guest each week with someone who has their “finger on the pulse of what’s happening out there in cyberspace.” First up is Chas Licciardello, adding some nice trivia and video finds. But for a show that critiques production design and visuals within its charter, whose idea was it to seat him about three football fields away? I thought Margaret would need a megaphone just to talk to him. I appreciate a desire to distance the show from the format of 2 critics, but this feels extraneous. Nevertheless, please move guest to desk for a single segment. The final review was for the film Samba, in which Margaret decided Blundell was a much tougher critic than she. I kept waiting for the exasperated “Oh, Graeme!” but it never came. Yet. No doubt viewers will also be longing for disagreement, absent on this most universal of premieres. It will be interesting to see whether Screen reviews content on Netflix and Stan (it needs to if it wants to remain credible) and whether YouTube and assorted web TV debuts are also up for grabs. I have faith Margaret moves with the times. While Screen is unlikely to notch up 28 years on air, we can be grateful it is in good hands with two passionate storytellers, helping us to wade through a plethora of content on the big screen and small. Not 5 stars yet, but perhaps I’m just a tougher critic too. Screen airs 8pm Thursdays on Foxtel Arts. Now that MP has moved on to a new home I wonder whether somebody who knows something about presenting will tell her to stop starting every single sentence with “I think…”. She’s talking and giving us her opinion so it’s self-evident that it’s what she thinks. Saying “I think” before every utterance used to be regarded as a newbie failing, but it’s now reaching epidemic proportions on TV, principally among female presenters. For women (particularly avowed feminists) who want to sound more assertive, or would hate to think they sounded continually apologetic, then dropping all the “I thinks” should be your first goal. What about that desk that they had poor Chas exiled to? 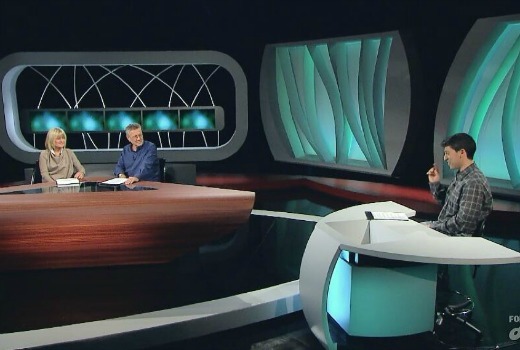 The only desk that matches it for ridiculousness is the ABC news desk. Somewhere there is a factory turning out ugly, impractical desks! Who are the idiots that think they are worth buying? Oh, and by the way, this is the only program we’ve watched this week on the new Arts channel. Underwhelmed by it as well, I’m sorry to say. When did she indicate that? In an interview I ran she indicated it was David who was tiring. 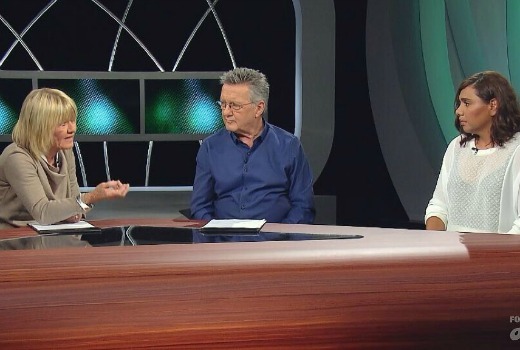 I seem to remember when Dave was ready to go, she didn’t try to continue with a new co host, remembering they had numerous temporary replacements over the years on both the SBS and ABC shows as needed. Not so sure about “numerous replacements”, a handful yes. Their attendance record for 28 years is pretty unblemished. Which is why I understand the logic of not continuing At the Movies brand without him. In any case her interview here outlines Stratton’s desire to wrap, her continued passion, new projects “on the boil” and her encouragement of a new review show for ABC. I doubt Foxtel forced out Studio to start their own Arts channel to support their main competition. There’s only a few shows premiering on Stan and Netflix (House of Cards, Orange is the New Black, Better Off Saul) and if they do convince someone to check-out a show by subscribing to one of them, they are likely to cut back on their Foxtel subscription. Churn is one of Foxtel’s problems. I see Margaret is continuing with her self-confessed policy of giving Australian movies and TV shows an extra star or two. Yes – I think most people just continue with their policy of subtracting a star or two from locally made material if reviewed by Margaret, she is a good reviewer but sometimes her enthusiasm just seems to get the better of her usually sound judgement, I haven’t seen enough of Blundell’s reviews yet to see if his consistency is up there with Stratton’s reviewing.